Sign up for the date you want below! There is nothing to prepare. You can start any week! Beginners are welcome! Experienced actors are welcome! You can work at your own level. Bring $35 cash (exact change please) with you to the Workshop! $35 class tuition must be received before student enters class. Weekly Workshops are FREE to students currently enrolled in our Elite Program. All you have to do is sign up below. These are Drop-In Acting Classes, Open to the Public. This session time 5:00-6:30 time is for Tweens ages 9 to 12. If you are 8 or Under, click here! If you are a Teen or Adult, click here! You are curious about acting, and want to start by getting your feet wet without a big commitment. 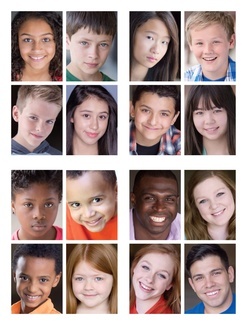 These are excellent acting classes that you may attend exactly as often as you want. Think if it as YOUR acting class - but you can take it a la carte! You are interested in pursuing acting more seriously, and want to audition for our Elite Program (age 25 & under). You want to check out our school with a drop-in class to help you decide if you want to audition for the program. IMPORTANT: In order to attend, you must SIGN UP so we know who's coming. You can start any time. You do not have to start at Week 1. It is not cumulative. If you can't make it, please cancel on this form (not via email, phone or any other method). This is where the teachers check for sign-ups. Be sure you note there are 2 different locations! Look carefully! Look for our sign between Kumon and State Farm in the King Soopers lot. We don't have a sign on the building in Lakewood, but we are right between Karate and Subway, near Big Lots and Wendy's!